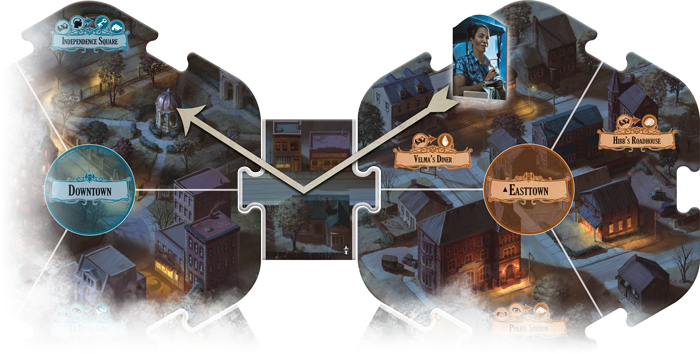 Before you ever embark on your first game of Arkham Horror Third Edition, you have choices to make as to how you will meet your doom, selecting a scenario and choosing an investigator to embody in the world of Arkham Horror. These investigators all receive unique starting items and have special abilities, giving them a distinct identity for your adventures. 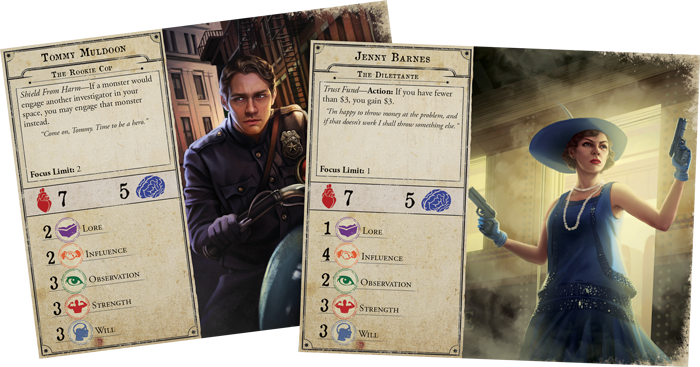 You may defeat evil with style and panache with the dilettante Jenny Barnes, or protect the streets of Arkham with police officer Tommy Muldoon. 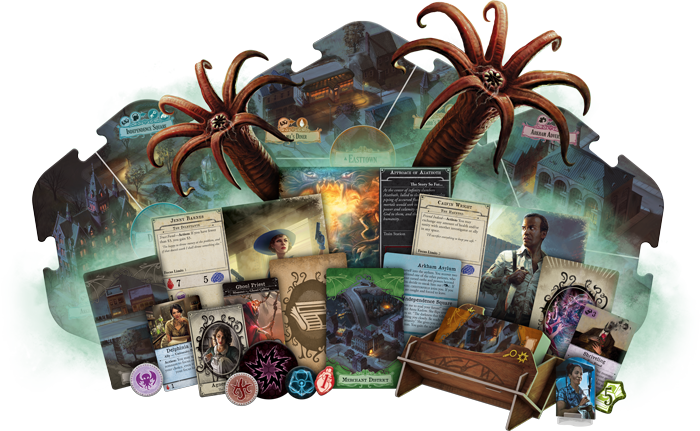 Players of Arkham Horror: The Card Game and Mansions of Madness will already be familiar with these investigators, as they are some of the most prolific heroes of the Arkham Horror Files! 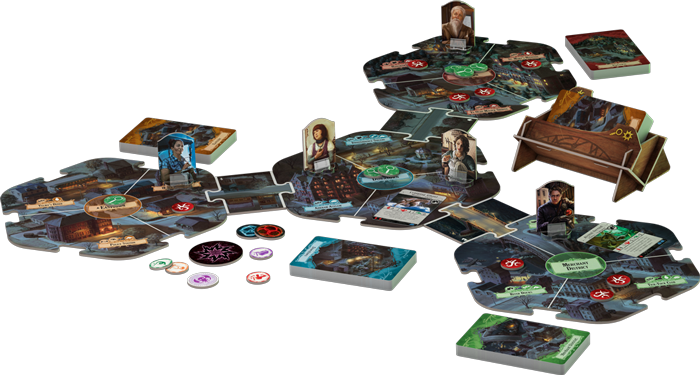 A game of Arkham Horror Third Edition is split into a series of rounds. You and your fellow investigators won’t know how to win the game immediately—it's not as simple as just closing gates to other worlds! Every scenario begins with archive cards that narratively propel the scenario and provide short-term goals for your investigators to accomplish. As more cards are added to the codex, the mystery begins to unravel, and the investigators just may discover a way to impede the darkness. But as with all games in the Arkham Horror Files, things never quite go according to plan. As doom spreads across the city, other cards will be added to the codex, cards that see the world inch ever-closer to being engulfed by the unkown. The spread of doom, the approach of an Ancient One, and even the investigators' own choices can lead to new cards being added to the codex, making every turn vital to your success. 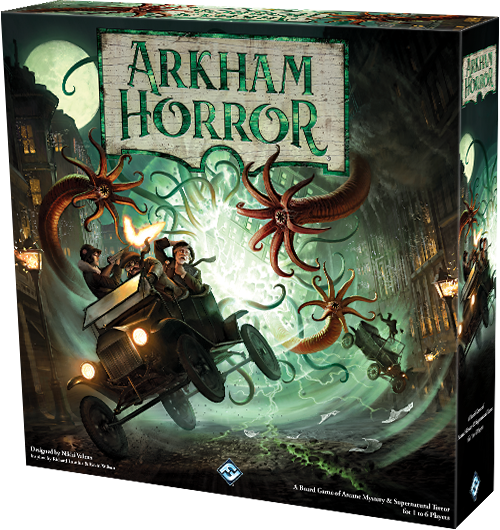 With a fully narrative approach and a branching path within each scenario, Arkham Horror has become a more thematic experience than ever before. As with other games in the Arkham Horror Files, researching clues will often be the key to victory. But this is not always the case, you can never be sure what your next goal will be, meaning you must quickly adapt to new plans. A fully modular board composed of double-sided tiles makes every game of Arkham Horror Third Edition a different experience! Investigators can move two spaces during their turn. The symbols on spaces represent what kind of encounters await you! While investigating clues will propel the narrative in a positive way, you'll have to be vigilant for the threats that lurk in the night. The dark forces beyond the veil are just beginning their assault on your reality. The Monster Phase sees the nightmares on the board lurch to life, closing in and attacking investigators. Each investigator has a damage and horror threshold, and attacks from the enemies that you face gnaw at your health and sanity. When health or sanity reaches zero, the investigator is defeated, succumbing to their injuries or utter madness. Every monster in Arkham Horror Third Edition behaves differently and poses a different threat. While some monsters will remain stationary, serving as an obstacle to your investigation, terrifying Hunters will close in on your investigators, forcing them to deal with the evil at hand. Investigators will have to gather weapons, spells, and more to deal with these creatures during the Action Phase. The Encounter Phase sees the next chapter of your adventure revealed as you draw encounter cards based on your current location. Each neighborhood features its own deck of encounter cards, and in addition to those cards, every scenario adds its own unique events to these decks, granting even more variety to each scenario. These encounters are also branching within the larger story, and they can go right or horribly wrong based on skill tests. Perhaps the local police finally believe your story, or maybe the mystical runes you found hide a nasty surprise. Every investigator has five different skills that compose their character: lore, influence, observation, strength, and will. The numbers next to these skills indicate how many dice you'll roll during a skill test. If you can roll at least one five or six, the test is successful! Of course, the more dice you roll, the better your odds of succeeding, so you'll want to make good use of the focus action to increase your skills. Jenny Barnes has ended her turn at Arkham Asylum, where she befriends a fellow patient and decides to sneak him out using an observation test. With an observation skill of two, Jenny Barnes rolls two dice in search of a five or six. The odds aren’t great, but every ally helps in your lonely struggle for survival. After every player not engaged with a monster has drawn an encounter card, the Mythos Phase begins. 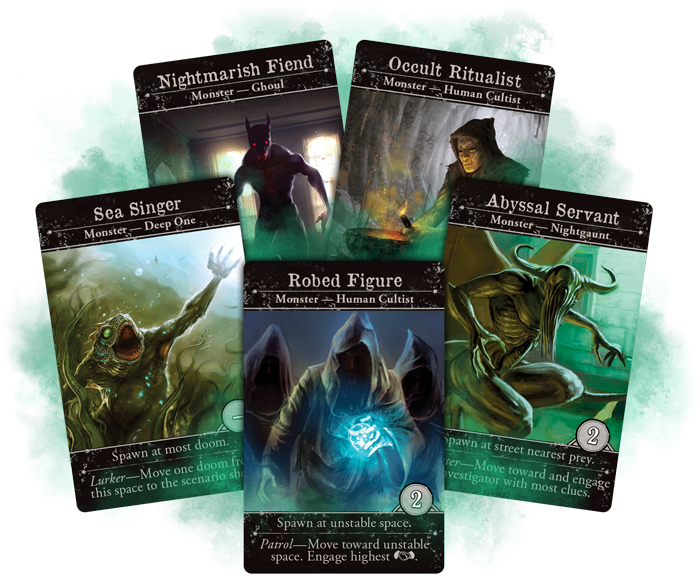 The Mythos Cup is an integral part of the game, changing the face of Arkham by summoning doom and monsters to hunt your investigators, but also spawning new clues, beacons of hope for your investigators to find and advance the narrative. Various tokens are placed in the Mythos Cup at the start of a scenario, as dictated by that scenario's specific rules. At the end of each round, each player will pull two tokens from the cup and follow their directions, changing your fortunes and unleashing terrible new blights on the city of Arkham. Once the shadow of the Mythos Phase has passed, the investigators are free to investigate during the Action Phase once again, if they are still standing. With every passing turn, Arkham and your investigators shift and change. As the eternal darkness begins to eat away at their soul, will they have the fortitude to continue their journey? Behind our own dimension lurk horrors beyond comprehension. No longer can you drift blissfully unaware on the blind side of the veil. Evil lurks around every corner. Can you save the world with your sanity intact?